Alec Saunders revisits the state of Voice 2.0 in a response to a post by Jim Van Meggelen regarding the lack of integration between PBX�s and carriers. At a recent telephony conference, we saw many telcos reporting about the progress on their open platform initiatives and how there was this glorious future for us all to look forward to. They showed slides and used all the right language about it. That’s all well and good, when it is nothing more than slides, with no definitive dates and nothing concrete about it all really. I’m sure the carrier is quite comfortable talking about open-platforms, as long as it’s slideware discussing some some ill-defined “out there” future. But how comfortable are they when the idea of an open platform, that really lets third-parties offer tightly-coupled services to their customers, stops being just an “idea” and becomes a reality, here and now? On the left, we have the closed vertical platform provided by carriers today. The same applies whether we’re talking about a traditional 130 year-old carrier, or an upstart 3-year old VoIP player. The supposedly revolutionary 3 year-olds simply copied their grandparents when it comes to opening their platform to third-party innovation. On the right, we have the result after a customer connects the PhoneGnome device. With PhoneGnome installed, the services stack above “access” (the local number and local services) is open to any third party provider, without the support or cooperation of the underlying telco access provider required. It is “unbundling” at the customer premise (or “unbundling at the edge”) without the nightmare that is traditional telco-based “unbundling”. “Open” is beyond the abstract and slideware now. With the installation of a simple enabling CPE device, anyone’s service (and brand) can now be seamlessly inserted into the experience for any existing fixed line user, any telephone number anywhere, without the requirement to partner with the underlying telco. It is a “pay as you grow” model with no requirement for a large initial cap-ex outlay. The footprint is immediately the entire world, anywhere there is broadband internet and POTS service. And it is here now, in use by real customers, and empowering real non-telco third-party services, provided directly to existing telco customers. UPDATE: in the above diagram, the idea is to show the telephony experience as an “application stack”. At the lowest level I show “Access” which in the telphony service sense, I define as the “local service” so it includes local calling, 911, and other related local services. Next I show “Calling Features” which I define as the traditional features, sometimes known as CLASS features, like three-way calling, call waiting, *69 etc. Above that we have “Minutes” where in this case we’re talking about long-distance and international calls. 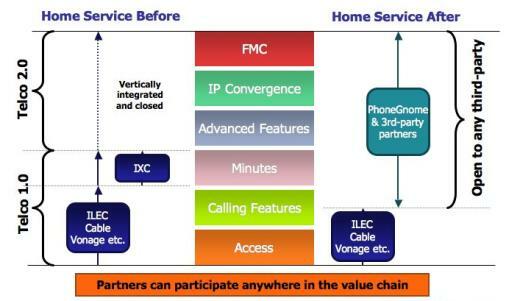 In the current telco model, we can select a separate provider from our local service provider for these calls (when using a traditional telco — not so with Cable andVonagel-like VoIP, where it is vertical and fully bundled). All the above layers in the stack represent Telco 1.0, the telephony services that have been around for decades. Above these Telco 1.0 layers we start with what I show on the stack as “Advanced Features” which I classify as those features that are still mostly telephone-like, or closer to traditional telephone features, but seldom available in the traditional world, including features such as find-me, simultaneous ring, remote access, softphone access, etc. These Telco 2.0 layer definitions are a bit arbitrary as in some sense, Telco 2.0 features and apps are basically just everything we can’t do under Telco 1.0. The chart next breaks out “IP Convergence” because it is a potentially very significant to the future of telephony, where we start to tie the phone experience to the web experience, integrating IP apps, etc. This is where the telphone becomes just another Web 2.0 service and things get really inrteresting. Simple examples here are things like click-to-dial, web-conferencing, and such. But the really exciting thing is the potential here. The really exciting apps are certainly those yet to come (think the web in 1992 vs. 1997 vs. 2007). Finally I show “FMC” (Fixed/mobile convergence) at the top of the stack, mostly because it is a hot segment right now, getting a lot of attention, and listing it here highlights how “unbundling” exposes even tightly-coupled functions and features to third-parties. I somewhat agree with the rant about telcos and upstarts. I am nevertheless a bit puzzled by what you call "unbundling" at the CPE. Can you elaborate a little bit more and give some examples?